Back in 2011 severe flooding caused by heavy rains in the north, northeastern and central Thailand had caused hundreds of deaths, affected 13.6 million people and inundated almost the entire capital of Bangkok. It was “the worst flooding yet in terms of the amount of water and people affected,” according to some reports. With monsoon rains pouring almost everyday, what happened two years ago can possibly happen again this time. Say for instance the district of Mae Sot in the northern province of Tak. Twenty communities in the said district are suffering from flood after they were pounded by heavy rains on Sunday. The water is reported to be about one meter deep. 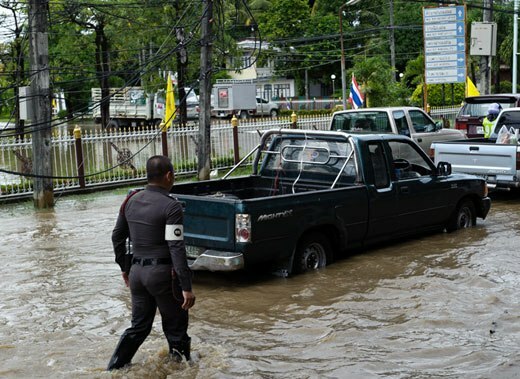 If the rain continues to fall today the government expects another 100 million baht loss will be recorded, said custom officer Phongtep Buasap. Border trade between Thailand and Myanmar has stopped, he added.